We charge according to the volume of waste or junk that we take. Our rates include the loading of all rubbish from anywhere on your premises, a sweep up of the site and responsible disposal/recycling of all waste. A Waste Transfer Note is emailed to you the same day. The trucks have a load capacity of 14 cubic yards, twice the capacity of a standard skip. To help you estimate the amount of junk you have, 1 cubic yard is approximately the same size as a standard household fridge/freezer. You don't need to commit to a specific number of cubic yards, our flexible pricing means you will only pay for the junk or rubbish we take away - the prices shown are to help you estimate the cost of removal. Please don't hesitate to call or email to discuss your requirements, you can even send us a picture of the rubbish to help us give you an accurate quote. We'd love to hear from you! 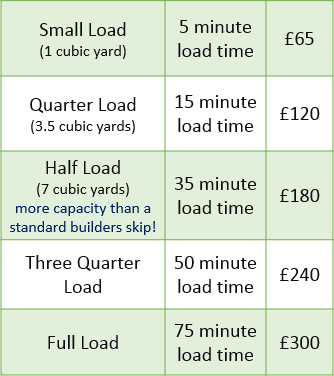 For very heavy waste we charge by weight instead of volume, for example dense materials such as soil, rubble, concrete and bricks. As a rough guide 30 bags of rubble would weigh around 1000kg. Please contact us so we can provide our most competitive price.